Made in 1998 in Belfast, Northern Ireland, the film "Divorcing Jack" stars David Thewlis as Colin Bateman's main character, journalist Dan Starkey. Jason is Cow Pat Keegan, an IRA gangster who is keen to keep politician Michael Brinn (Robert Lindsay) from becoming the Prime Minister. 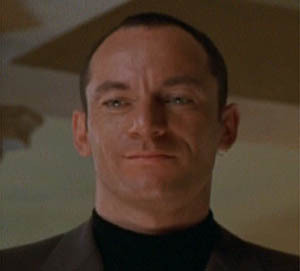 This still remains my favourite Jason Isaacs film, despite all that has come before and since. It was the first DVD I bought purely because Jason was a part of the cast. Why did I choose this particular film? Not because of the plot or reviews, but because it was the cheapest of his films available on Amazon! But what a gem it turned out to be! A thriller, a comedy, a chase movie... it's difficult to categorise, but not at any time whilst watching this film did I feel disappointed - not even with the ending. So what makes this a brilliant film? Divorcing Jack is based on a book of the same name by Colin Bateman, a man who writes very funny and witty stories about something close to heart, his homeland of Northern Ireland. The author was also responsible for the screenplay so the film stays faithful to the original story and it doesn't become disjointed as other films based on books can be. The film is about the politics and terrorism of Northern Ireland. Not a very funny subject, but add Dan Starkey (played by David Thewlis), a cynical Belfast journalist and the humour starts. Dan's girlfriend is murdered, his wife kidnapped, he is shot at and is rescued by a nurse who at night supplements her income as a nun-a-gram. It becomes a roller coaster of ride for Dan as he tries to solve the murder and rescue his wife. As you can see, I have yet to mention Jason! Maybe this is why I love the film so much, because in its own right the film is excellent and there is no need to sit there with your finger hovering over the fast forward button, jumping from one Jason scene to another. The cast, the script, the locations... in fact everything is enjoyable and then just when you think it can't get any better, in walks "Cow" Pat Keegan. Jason is the icing on the cake (or should that be the jam in sandwich!) Jason plays his role with such confidence. The is accent is brilliant, the facial expressions are spot on (as is the strut), and he has some of the funniest lines in the film. And, as we know, he does play a baddie very well. In the end the bad guys lose and Dan triumphs in his own way by saving his marriage to Patricia. If you haven't seen this film yet, I highly recommend it and if you have, watch it again or read the book, as it does add a little more to the plot. And I haven't even mentioned the taxi driver! Shorn-haired "Cow Pat" Keegan is, perhaps, Jason's wittiest role to date. He has more fun with his Belfast accent than anyone has a right to, but really the entire film is a delight. It's hipper than 'Lock, Stock' and classier than 'Pulp Fiction,' but just as bloody as either of them (and perhaps even darker, in some aspects). Plus, without the ensemble cast of the latter films to sort through, these characters stand out moreóand then some. Word of advice, though? You might miss a lot if you don't brush up on your knowledge of recent events in Northern Ireland, since so many of the lines and comic angst are inside jokes from that region. Because of this, the film has achieved an odd kind of esteem in the country, especially thanks to Dublin-born director David Caffrey. Compared to Jim Sheridan, who's typified as the hard, gritty poster boy of Ulster with films like 'The Boxer' and 'In the Name of the Father," Caffrey's 'Jack' is simpler (and way funnier), yet remains just as edgy. If you want to do it right, I recommend reading the book, and then sitting back and enjoying the ride (especially the taxi ride, which put me in tears).